When I first got into the Lounge Revival scene, I continually wondered why original era Lounge music was so saccharine. It wasn’t all that way, of course. If it were all that way, Lounge Revival would never have become a 1990s fad never mind a modern living subculture. But you have to admit: For every “Fly Me To The Moon” by Frank Sinatra, there’s some awful Les Baxter cover by Ferrante & Teicher. I am sure the diabetes-inducing sweetness of some Lounge music came from executives trying to sell tunes assembly-line style to that idealized middle-American family that everyone believed existed (but no one could find) at the time. I mean, comb the thrift stores long enough and you’ll eventually turn up copies of Music For Washing And Ironing by The Somerset Strings or an album from the Music for Gracious Living series, proving that a lot of music executives were just making up their own markets as they went along. But, really, what would make Bob Thompson release something as cartoony (and cool) as “Starfire ?” I suppose if you keep in mind two words — Atomic Age — and take a “point / counterpoint” approach, the syrupy sound of a lot of Lounge music makes sense. 1962 is the “sweet spot” of the original Lounge era for many Lounge Revivalists. It was the year President Kennedy reaffirmed America’s pursuit of a manned Moon landing; It was the year Eero Saarinen’s TWA Flight Center opened at Idlewild (now JFK) Airport; It was the year the first James Bond film, Dr. No, premiered and The Space Needle opened at the Century 21 Exhibition in Seattle; And it was the year Vince Guaraldi won a Grammy for his jazz single “Cast Your Fate To The Wind” and Esquivel! released both Latin-esque and More of Other Worlds, Other Sounds. 1962 was also the year the Earth almost became a glowing nuclear slag heap. The subconscious unease Americans felt about Soviet power after the launch of Sputnik in 1957 now came to the conscious forefront due to ’62’s Cuban Missile Crisis. It was thirty seconds to midnight on everyone’s internal doomsday clocks then and those on both sides of their leaders’ fence were quite certain some lunatic on the other side was going to push the final button down. In short, Americans were nervous about nukes and would be until the collapse of the Soviet Union in 1991. And the sentimental, schmaltzy, Lounge music of the day stood in contrast and counterpoint to this spirit of fear. Americans wanted freedom from The Bomb and Lounge music gave them that escape — including the primitive technology- and Bomb-free Exotica island paradises and high-tech Space Age Pop utopias we Lounge Revivalists love so much. To be sure, the mid-century had its dark side. But, exploring that dark side can give you some much needed savvy about the culture of our favorite era. At the very least, it can provide you a theme for your next backyard party. (Admit it: You’ve always wanted to throw Donald Fagen’s “summer smoker underground” in a bomb shelter.) With this in mind, I recommend Survive The Bomb: The Radioactive Citizen’s Guide to Nuclear Survival. Curated by Weber State University history professor Eric Swedin, Survive The Bomb is a survey of American Cold-War-era nuclear war preparedness as seen through reproductions and summaries of various U.S. government documents of the period. Aimed at a popular audience, Swedin’s book mostly eschews top-down academia (foreign policy, politics, military history) and, instead, focuses on civil defense and grass-roots preparedness at the individual and community levels. 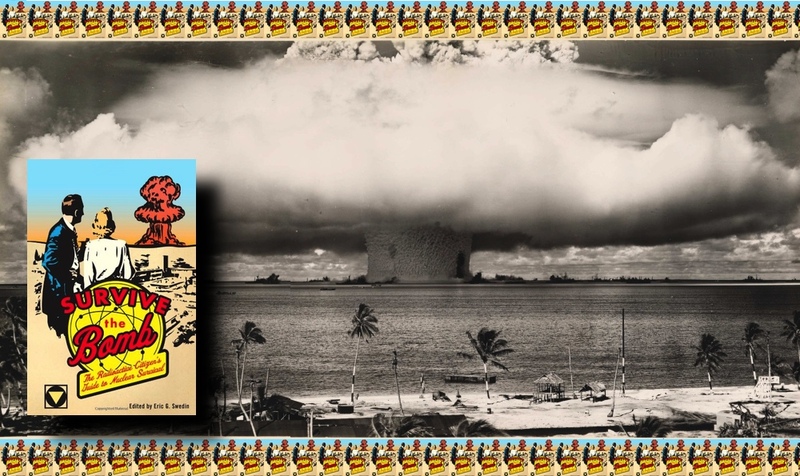 Simply, the book is an everyman’s guided tour through Atomic Age living. Decade by decade, Survive The Bomb shows the changing attitudes throughout the Cold War period. In the 1950s, it was about World War II style solidarity and community involvement — building basement bomb shelters; joining Civil Defense units; and making sure one kept “Grandma’s Pantry” (one’s emergency rations) fully stocked. By the 1980s, the truth about the survivability of nuclear war made solidarity and community involvement moot. Even though Duck and Cover (1951) was still shown as a public school classroom film in the Reagan era, it was a naive joke in the face of fully developed public awareness and numerous Ban The Bomb protests. Aside from the well-conceived focus of the book, it’s the little things in Survive The Bomb that make it worthwhile. Numerous sidebars are filled with minor but still significant factoids and commentary. (For example, LBJ’s anti-Goldwater “Daisy” campaign commercial aired only once. And that was enough!) And, for those like me who want the verisimilitude of the milieu, there are plenty of reproductions of basement bomb shelter plans, Civil Defense preparedness handbooks, wallet cards, and even a comic book for kids by L’il Abner creator Al Capp! Admittedly, the book can sometimes be difficult to penetrate. Despite its snappy graphic design, cool reproductions, and keen focus, it’s still a book of government documents. But after uncovering all the weird Cold War practices, procedures, and propaganda, Survive The Bomb will, with some personal consideration, yield some useful insights into the art, design, music, and pop culture of our favorite era. It was, after all, the Atomic Age. Boom!